A road trip to the charming province of Laguna—with its many interesting cultural, historical and artistic points—is a definite must-do for those who want to see more of the Philippine countryside. Laguna offers rustic accommodations, the tastiest Southern Tagalog cuisine often flavored with coconut milk, and the most attractive destinations that soothe the world-weary soul. You can go on a day trip or stay overnight in one of the many affordable accommodations in the province. Homage to a hero. 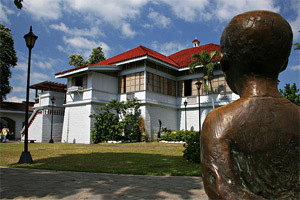 History buffs should drop by the Rizal Shrine in Calamba City, Laguna, to discover how Jose Rizal, as the boy Pepe, lived, and how his surroundings shaped him into becoming a national hero—dying for his convictions and for the hopes and dreams for his country to be free from corrupt foreign dominance. The house that stands on the property was actually reconstructed from the original structure, which was destroyed during World War II. A stark white affair topped with red-brick roof shingles, reconstruction of the house was directed by the hand of the National Artist Juan Nakpil. Into the woods. The Makiling Botanical Gardens at the University of the Philippines in Los Baños (UPLB) is actually part of the forest reserve of Mount Makiling, an inactive volcano shaped like a sleeping woman, which has spawned an indeterminate number of myths, folk tales and short stories of its fabled resident and protector, Maria Makiling. On Mount Makiling thrive rare plants and endangered flora. There are also a number of medicinal and ornamental plants that UPLB Forestry students have planted around the reserve, while orchid societies have donated several native species. Grim Reaper’s trophies. In Nagcarlan, one can visit the town’s underground cemetery, which is the only one of its kind in the Philippines. Declared a national historical landmark in 1978, the Nagcarlan Underground Cemetery built in 1845 holds tombs of rich Catholic families in the area from the Spanish period. 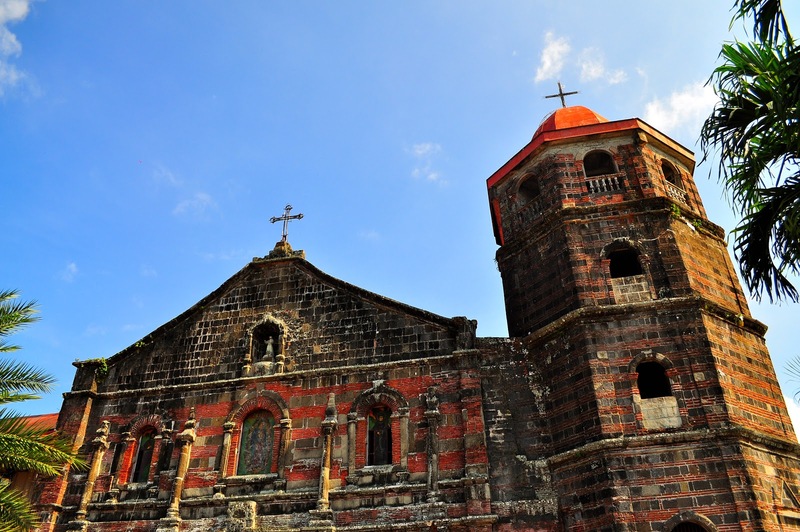 Locals believe that there is a secret tunnel that actually connects the underground cemetery to the Nagcarlan Church (Saint Bartholomew Parish Church), founded in 1583, as most churches in that era usually had underground cemeteries. The Underground Cemetery was also used as a secret meeting place of the Katipuneros during the Spanish period, by Filipino rebels during the Filipino-American War and by guerrillas working hand in hand with Americans trying to outwit the Japanese military during World War II. A lake with a view. In San Pablo City, Laguna, one of the most relaxing pastimes locals engage in is to sit by the glistening Sampaloc Lake, and enjoy a picnic lunch. In the morning, some run the five-kilometer stretch around the lake, the smallest of all seven lakes of the city. A few, on the other hand, sit on the many park benches dotting the paved area around the lake, and just take in the sight, breathe in the crisp air, getting lost in their own thoughts. It can be crowded at times, especially on weekends and holidays, but the view of majestic Mount Banahaw, and the lesser Mount San Cristobal, can be the most tranquil of diversions. Once or twice a month, at dusk, with the glorious golden moon rising above Mount Banahaw and casting its alluring reflection across the lake, the sight can literally take your breath away. Attend a fiesta. San Pablo City comes alive during Good Friday, when a procession of images of saints, the Holy Family, and that of the passion and death of Jesus Christ is held. The images paraded are truly remarkable feats of Filipino craftsmanship and design. The elaborate detail in the clothing of the santos (saints), like those of the Blessed Virgin, for example, are also testimony to the adoration of its owners and the dedication to their faith. Take care of your feet. Filipinos are some of the most inveterate consumers of slippers—whether it be the Brazil-branded beach flip flops, the furry comfortable kind for the bedroom or the cushy type with prints used everywhere in the home. Liliw is the “footwear capital of Laguna” with its many stalls along Gat Tayaw Avenue selling slippers, shoes and sandals of all types, whether they be staid and simple, florid or flirty. Slippers here go for 3 for P100, while you can buy leather shoes for as low as P500. The annual Tsinelas (Slippers) Festival is usually held in August. Also check out the St. John the Baptist Parish Church for its red-brick walls. Buy some art pieces. 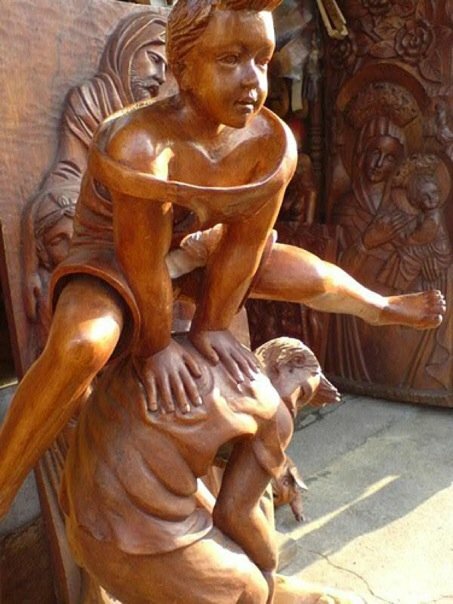 The woodcarvers of Paete are famous around the world for their fine craftsmanship and keen eye for detail. Many of their work stand in churches, or displayed during fiestas, while furniture made with painstaking detail make their way homes in the United States and Europe. Paete is also famous for its taka or papier-mâché pieces such as religious items, masks and animal replicas, most of which are now exported to the United States, Germany, Spain and Japan. These folk-art pieces are still handcrafted around molds some of which are probably antique and have been in the taka-making family’s possession since the founding of their businesses, and dried under the sun. Around this time, you will probably be able to pick up a number of papier-mâché Santa Clauses, reindeer and other Christmas fixtures, which are from the excess production of the exporters. JV Quesada Street is a stretch of ateliers and shops selling wood sculptures and taka. While in town, also drop by the Saint James the Apostle Church with its elaborate San Cristobal (Saint Christopher) murals made by artist Jose Luciano Dans, and intricate carvings of saints. The church itself, built in 1846, is designed in the usual baroque style of the time. Eat! Along the national highway in Barangay Dila, Bay, is Kamayan sa Palaisdaan sa Bay, a floating restaurant that serves an assortment of rustic Filipino cuisine like Ginataang Hipon (shrimp served in a coconut milk-based broth), Crispy Pata (deep-fried pork hocks), Sinugno na Tilapia (grilled tilapia sautéed in coconut milk with mustard greens). No pretense-cooking at reasonable prices, albeit the sometimes long serving time. Si Christina Gateau Sans Rival (6 Rizal Avenue, San Pablo City) is a great place to have coffee and dessert after a day of sightseeing. Its specialties are red velvet cupcake, New York cheesecake and sans rival, to name a few. It has pastas as well, and an interesting array of Italian sodas. Have lunch or dinner in the calm, lush surroundings of Café Lago located across Sampaloc Lake. It serves Filipino food common to most of the restaurants in the area, but what makes the meal special is a history of Sampaloc Lake and San Pablo City by the café owner Mandy Mariño, a retiree from the US. If he sits with you long enough, he also might be persuaded to tell you his colorful love life. Sir Mandy can also give you tips of other unique places to visit or other sites of interest. The original store of Colette’s Buko Pie (52 San Rafael Street) can also be found in San Pablo. Where to stay: Casa San Pablo (Gomez compound, Barangay San Roque, San Pablo City, (CP# 0917-812-6687) is a quaint inn in the heart of San Pablo, operated by gregarious businessman Boots Alcantara and his warm and winsome wife, journalist and author An Mercado. Their good nature and hospitality are part of the charm of staying there. Each room in the inn is designed with its own artistic motif, and uses antique pieces and lumber from old houses and repurposed as accessories or structural pieces. The inn serves homecooked dishes, such as the Kulawo (grilled eggplant in smoked coconut milk), a great favorite among diners. Guests in Sitio de Amor (Km. 88.8 Maharlika Highway, San Pablo City (http://www.sitiodeamor.com) are assured of seclusion and privacy so urgently needed in our harried lives. The rooms are located far apart across the farm so guests usually see the other visitors only during mealtime, or at the languid infinity pool. Owners Jorge and Amor Bondad are the most hospitable and friendliest of couples, sharing stories from their lives and how they came to setting up their resort. Amor is also quite the whiz in the kitchen as she ably whips out a welcoming feast of dishes using local ingredients with just an hour’s notice. Every August, guests can pluck rambutan from the Sitio’s trees and eat them as the resort celebrates the Rambutan festival. To Calamba: Take a Green Star Express bus along Taft Avenue, Pasay City, or HM Transport bus from Edsa, Cubao, Quezon City, going to Santa Cruz and Calamba. By car, just take the South Luzon Expressway (Slex) and go through the Calamba Exit. To Los Baños: Take the same bus above to Santa Cruz and tell the bus driver you want to go down at UP Los Baños. By car, also take the Slex and the Calamba Exit. The town after Calamba is Los Baños. To Paete: Take any bus going to Santa Cruz, go down Barangay Biñan in Pagsanjan, then take a jeepney to Siniloan. Alight at Paete town proper. By car, it is fastest to go through Rizal via the Manila East Road, with Paete only four towns away from Tanay. To San Pablo: By bus, take any bus bound for Lucena City; it will pass by Maharika Highway and take you through San Pablo. If driving, from the Slex, use the Alabang-Calamba-Santo Tomas Expressway and go out the Santo Tomas, Batangas Exit. When you reach the junction across the Light Industrial and Science Park III, turn right on Maharlika Highway, and keep left going toward SM San Pablo.